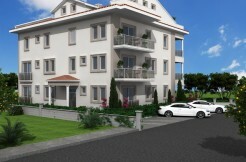 This is a brand new detached villa with private pool and garden and is only a 10 minute walk to Calis beach. 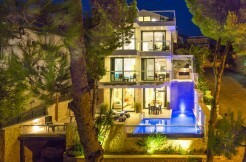 The villa has been built over three floors with all rooms being of a comfortable size and bright. The property enters into an entrance hall, with an open planned kitchen and dining area and from there leads to the lounge area, there are two sets of large patio doors with sliding doors leading out to the poolside. The kitchen is large with a contemporary design and black granite worktops. There are two double bedrooms on the first floor each with private bathrooms and balconies and the master bedroom with en suite bathroom and roof terrace can be found hosting the whole of the top floor. All bathrooms have been finished floor to ceiling in marble tiles using top quality fixtures and fittings. The private swimming pool is of a good size, with a poolside shower and roman steps leading into the pool. The garden is mature with lawn around the pool terrace, alongside of the property is a private driveway with secure gate from the main road. The property features spacious rooms, Parke flooring in all bedrooms and a large fully fitted kitchen. The villa is situated in a quiet residential area on the edge of Calis and is less than a 10 minute walk to the beach front, with the local bus route running near to the property giving direct access to the main town of Fethiye being only a 10 minute drive and Dalaman International Airport just 45 minutes.